Head over to the Catch the Bug Blog to see what oldies the rest of the DT wants to show you! Beautiful coloring! Love the party paper! Thanks for playing with us at Aud Sentiments! Simple and clean card as I like. Beautiful boy and ideal paper for a birthday. It's very successful ! Congratulations ! Thanks for joining us at Charisma Cardz on our 3rd birthday this week. Fabulous card I love the image and colours. Thanks for joining our Birthday challenge at Charisma. What an adorable card! Love the image, papers and design! Thanks for playing with us in the Dutch Dare Card Challenge! I love your card. The image is so beautiful. Thanks for joining us this week at SSD. Good luck and hope to see you back next week. Adorable! 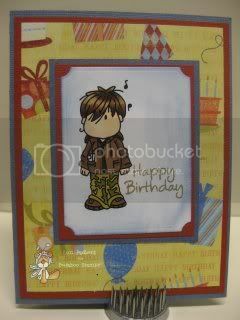 What an adorable birthday card for that special guy - aren't Bugaboo images just wonderful? Thanks so much for playing along with us for our "Use Your Scraps" challenge at Aud Sentiments. Good Luck and I hope you'll be able to join us for our new challenge on the 19th!